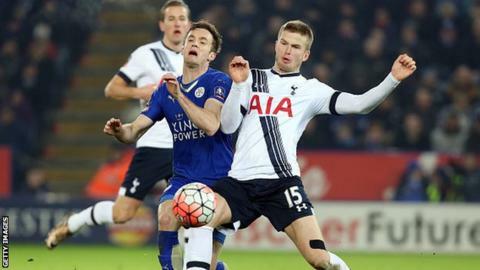 Leicester City midfielder Andy King says there is absolutely no pressure on the Premier League leaders. The Foxes are currently two points clear at the top with 12 games remaining despite being bottom of the table at the same stage last season. "I have heard people saying that we are under pressure, but we are under no pressure. That was last season, trying to stay in the top division," he said. "It was disappointing, the way we lost to Arsenal, but we will bounce back." Despite their last-gasp defeat at Arsenal on 14 February, King, 27, feels the Foxes can be satisfied with recent results. "We were of course disappointed to lose last week, especially the manner of the defeat, but if you had offered us six points from Liverpool,Man City and Arsenal, we would certainly have taken it," King told BBC Radio Wales. "Things are going well and you can imagine the training ground is buzzing at the moment. "It is brilliant to be playing for the team top of the Premier League. I am enjoying every minute of it." King, who has played 25 games for Leicester this season, feels the title run-in can benefit him when it comes to representing Wales at the European Championships this summer. "I think it will help me with Wales, playing in these big matches," he explained. "We are all new and inexperienced at big tournaments, so the more big games you can play (before the tournament) the better. "We have Gareth Bale and Aaron Ramsey used to playing at this level, but for other players, playing in these big games can only stand us in good stead for the summer."